The 2000s saw plenty of great players in the Big Ten. One, in fact, won the Heisman: Ohio State quarterback Troy Smith (2006), who arguably is the top player from the 2000s. Over the next couple days, I’m going to take a look at the best of the best in the Big Ten since the calendar flipped to 2000. First up: Offense. Before I get to the list, I have a couple rules: 1. A player had to play at least two seasons in the 2000s to be considered; 2. Nebraska players prior to 2011 are not eligible. WR: Braylon Edwards, Michigan (2001-04). The Biletnikoff Award winner as a senior with 97 catches and 1,330 yards, he finished with 252 receptions, 3,541 yards receiving and 39 TD grabs in an illustrious career in Ann Arbor. WR: Taylor Stubblefield, Purdue (2001-04). He left West Lafayette as the NCAA career leader with 325 catches. He also had 3,629 career receiving yards and 21 TDs. 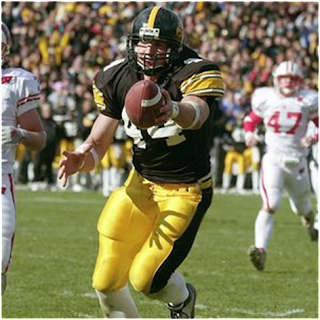 TE: Dallas Clark, Iowa (1999-2002). He capped his career by winning the Mackey Award as a senior, ending a career that saw him make 81 catches for 1,281 yards, 8 TDs in just two seasons as tight end. Clark had 43 catches for 742 yards with 4 scores in 2002. 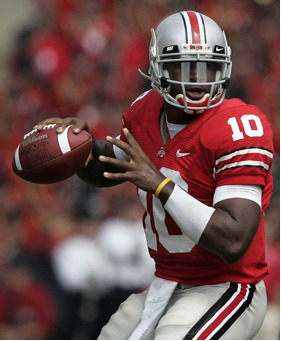 QB: Troy Smith, Ohio State (2003-06). There were some good signal-callers in the 2000s, but Smith gets the nod based on his 2006 Heisman season in which he led the Buckeyes to the BCS title game. RB: Mike Hart, Michigan (2004-07). The diminutive Hart rushed 1,015 times for 5,040 yards, both Michigan records, and 41 TDs. Hart placed fifth in the Heisman Trophy balloting in 2006 and ran for at least 100 yards 28 times and 200 yards five times, both Michigan all-time marks. RB: Montee Ball, Wisconsin (2009-12). The 2011 Heisman Trophy finalist and 2012 Doak Walker Award recipient, Ball scored 38 touchdowns in 2011 (one behind Barry Sanders’ FBS record) and finished his career with an NCAA record 83 scores. He also ran for a total of 5,140 yards. OL: Robert Gallery, Iowa (1999-2003). He began his career at tight end before morphing into an all-time great at tackle. As a senior in 2003, Gallery was a consensus All-American, the Big Ten Offensive Lineman of the Year and the Outland Trophy winner. He was the No. 2 overall selection in the draft. OL: Joe Thomas, Wisconsin (2003-06). The massive tackle returned for his senior season and helped the Badgers have the second-highest scoring offense and the fourth-best rushing offense in the Big Ten. Thomas was first-team All-Big Ten, a consensus All-American and the Outland Trophy winner before being picked No. 3 overall. OL: Greg Eslinger, Minnesota (2002-05). As a senior, the center won the Big Ten Offensive Lineman of the Year award, the Outland Trophy and the Rimington Trophy. Not bad for a kid from North Dakota who had no FBS offers. OL: Levi Brown, Penn State (2002-06). He arrived as a defensive lineman but flipped sides of the ball. Brown became a dominant blocker and eventual No. 5 overall selection in the NFL draft. OL: Jake Long, Michigan (2003-07). As a senior, Long was a unanimous All-American and won the Big Ten Offensive Lineman of the Year award for a second year in a row. The tackle subsequently was the No. 1 overall pick in the draft. K: Mike Nugent, Ohio State (2001-04). He broke or tied 22 school records. Among them: notching the most points in a career (356). He connected on 72-of-88 field-goal attempts and 140-of-143 extra-point attempts.